1.3 Our website incorporates privacy controls which affect how we will process your personal data. By using the privacy controls, you can specify whether you would like to receive direct marketing communications and limit the publication of your information. You can access the privacy controls via www.wingsandwheels.net/keepintouch. 2.3 We may process your account data ("account data"). The account data may include your name and email address. The source of the account data is you.] The account data may be processed for the purposes of operating our website, providing our services, ensuring the security of our website and services, maintaining back-ups of our databases and communicating with you. The legal basis for this processing is our legitimate interests, namely the proper administration of our website and business. 3.1 We may disclose contact details to our suppliers or subcontractors insofar as reasonably necessary for Wings & Wheels and/or Surrey Hills Challenge marketing purposes. 3.2 Financial transactions relating to our website and services are handled by our payment services providers, Worldpay. We will share transaction data with our payment services providers only to the extent necessary for the purposes of processing your payments, refunding such payments and dealing with complaints and queries relating to such payments and refunds. You can find information about the payment services providers' privacy policies and practices at www.worldpay.com/uk/privacy-policy. (a) Your contact details and transaction details will be retained for a minimum period of 12 months following 26 August 2018, and for a maximum period of 24 months following 26 August 2018. 6.3 You have the right to confirmation as to whether or not we process your personal data and, where we do, access to the personal data, together with certain additional information. That additional information includes details of the purposes of the processing, the categories of personal data concerned and the recipients of the personal data. Providing the rights and freedoms of others are not affected, we will supply to you a copy of your personal data. The first copy will be provided free of charge, but additional copies may be subject to a reasonable fee. You can access your personal data by visiting www.wingsandwheels.net/shop when logged into our website. 6.12 You may exercise any of your rights in relation to your personal data by written notice to us or by emailing or completing an online form at www.wingsandwheels.net/keepintouch, in addition to the other methods specified in this Section 6. This cookie is set by our content management system and is essential to the running of the website, especially the ecommerce shopping features. A unique 32 string code helps the website identify individual visitors but does not store or record any information about visitors, it is deleted from your computer once you close your web browser. Google Analytics helps us track page views and other statistics from visitors to our wbesite. It helps us identify the most popular content which in return helps us improve not only the website but also the event itself. No personal information is stored by these cookies. Some social features of our website such as our video page makes use of You Tube who in turn can pass a cookie through to your computer. The same can be said for the social network sites when Liking or Tweeting about articles on our site they may also pass a third party cookie through to your computer. Wings & Wheels has no control over these but you should be aware of them. 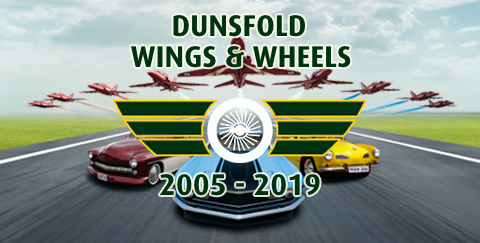 14.1 This website is owned and operated by Dunsfold Park Ltd.
14.2 We are registered in England and Wales under registration number 04482670, and our registered office is at Dunsfold Park, Cranleigh, Surrey GU6 8TB. 14.3 Our principal place of business is at Dunsfold Park, Cranleigh, Surrey GU6 8TB.